During our observation of the Calvary Cemetery, my team mainly noticed differences in gender between gravestones. 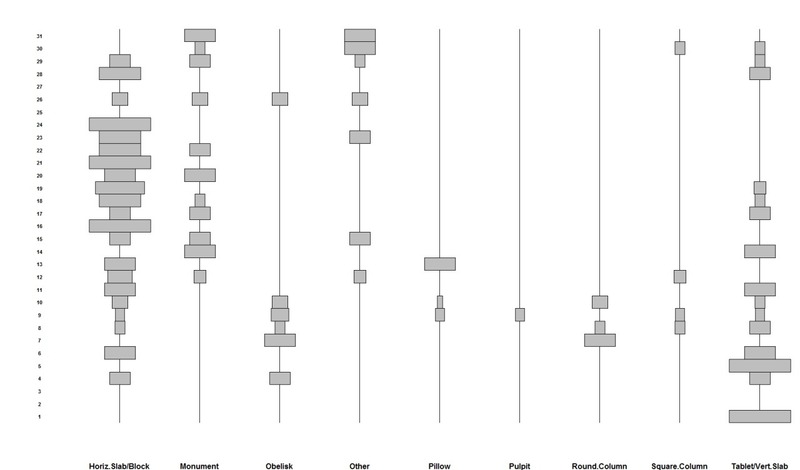 As other people have mentioned, our sample size (N=33) was quite small to be making general conclusions, but from what we observed, men’s gravestones tended to be larger than the women’s. In the family plots we found, the male head of the house was given a larger gravestone than the women and his siblings or children. In cases of memorial stones over family plots, it was often the case that the patriarch’s name would be on the large memorial stone, while his family member’s names would be on footstones in the surrounding area. This reflects our society’s habit of valuing men over women. Gender inequality is also shown in the decoration and detail of gravestones at the cemetery. Often, the men’s graves were monuments or columns, more richly decorated than the women’s. It seems pretty cliché that the only conclusion I can try to make is one of gender inequality shown at a Catholic cemetery, but there you have it. As my colleague noted, we discovered some interesting facts when we talked to cemetery staff; I learned about the Seattle flu epidemic that occurred in 1918-1919. Not being from Seattle, I don’t know anything about its history, so learning that prompted me to do a little side research into that time of history. Another interesting thing we discovered was that there were ‘forgotten’ burials in a section of the cemetery, people who could not afford footstones or any other gravestones. These people were essentially forgotten by family and staff. 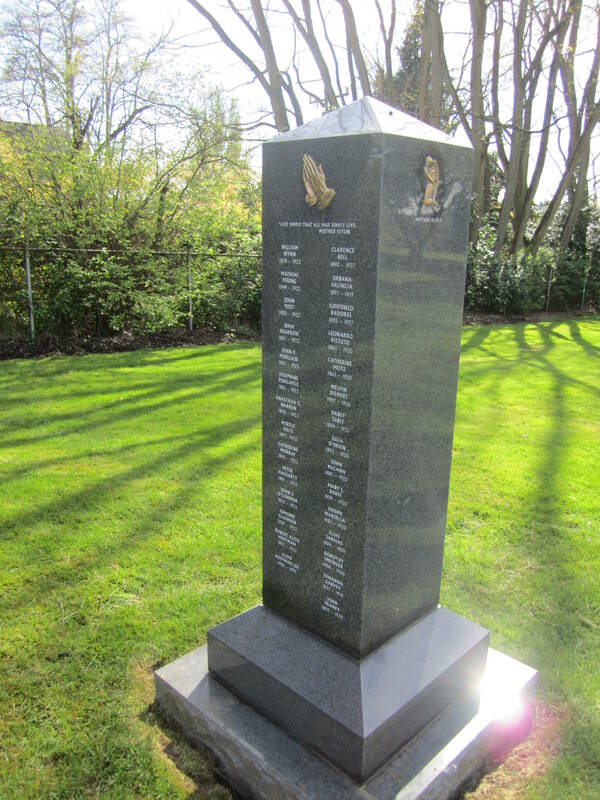 One of the staff members recently recovered information on these people’s names and birth/death dates, and has had a memorial erected for all those people. I had never considered the amount of information that we can glean from a casual walk around the cemetery. 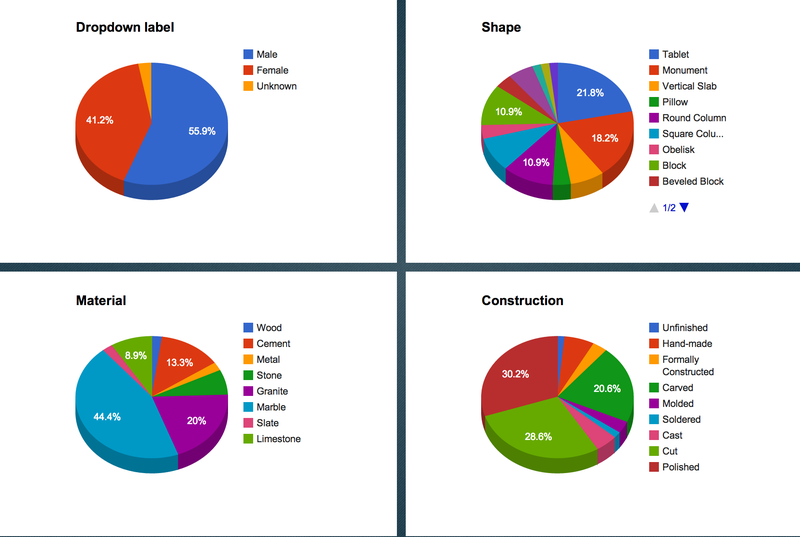 Our group decided to record our data using a custom webform through the free app, NestForms. It was super handy. I took about 20 minutes to set up the webform to match our paper forms, and I was really happy with the results. It was much easier to fill out a pre-designed form on a phone than worry about wind and rain destroying the papers. It even recorded our GPS coordinates. When we got home, printing out a database was literally 3 clicks. All of the data is saved in the cloud. Go technology! 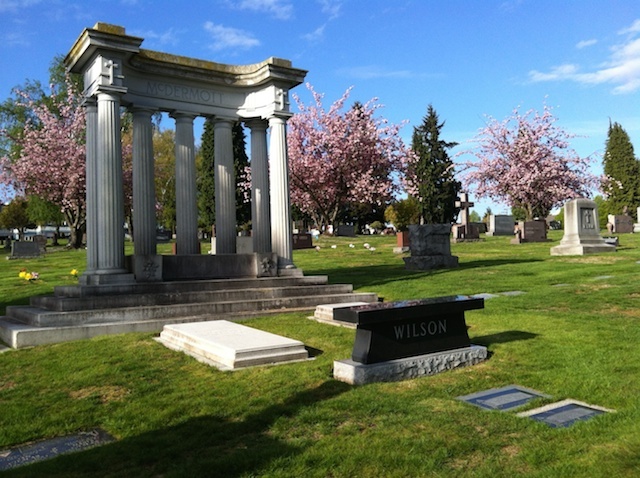 The Denny Regrade project of the early 20th century involved moving a cemetery. The catholics that were previously barried there, are now at the Calvary Cemetery. There was a flu epedemic in Seattle in the 1920s which accounts for a large portion of the cemeteries inhabitants. Particularly the graves of many young people. There was an entire section of burials that had been left unmarked. These were people who were unable to purchase large family plots due to unmarked graves. The Calvary Cemetery director recently created a monument for these people. Many of Seattle’s famous families have burials in the cemetery, including the Nordstroms. As others have mentioned, our sample size was so small that it is probably wrong to draw any conclusions from our findings. Alas, I will do it anyway. Our findings suggest that males may be more highly valued, as their graves were nearly three times as large as the women’s, 5.6 to 2.2 ft tall. This seems to be especially skewed in the family plots where a family patriarch has a large monument while his relatives have smaller graves surrounding it. We saw this several times throughout our survey. We also found that marble is by far the most common material used, comprising almost 50% of the graves. Our findings suggest that the use of marble has diminished in the last three decades however. Whether this is due to market forces or a culturally driven change is unknown. Interment frequency and generations in Calvary Cemetery, Seattle. While an undoubtedly morbid thing to study, death and how culture handles death is an exceptionally interesting source of information about any culture. Using our recent Graveyard Lab and a chart of internments, we can see some very interesting information regarding the use of this specific cemetery, its growth and how these match up with events, both local and global. This chart details the number of internments in five year increments from 1875 to 2010. In our collection we separated into each of the 5 primary areas of the cemetery and chose randomly 30 interments. What can be seen is that the period from 1900-1920 saw the largest spike of internments in the cemetery, followed by another increase in interments between 1936 and 1950. At first, I was tempted to believe that the first spike of internments was a result of the Spanish Flu pandemic of 1918, until I noticed another spike at 2006 to 2010. The last spike, could be considered the Baby Boomer spike, a generationally motivated increase in interment, and upon closer inspection, the vast majority of internments between 1900 and 1920 take place before the pandemic would have occurred, leading me to believe that this increase in deaths is related to a post-Civil War baby boom, similar to the spike being witnessed in the modern era with the Boomer generation. As for the 1936 to 1950 spike, I do not know of any regional, generational or cultural event that would culminate in this spike, and our data does not indicate that this is a group of soldiers who were interred in this period. It could be a result of the rationing and other life stressors that were occurring at this period due to American involvement in the war, but without further research, this question will remain unanswered. 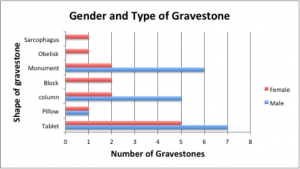 From the survey of gravestones in Calvary cemetery, we found that there are some differences between men’s and women’s gravestone . 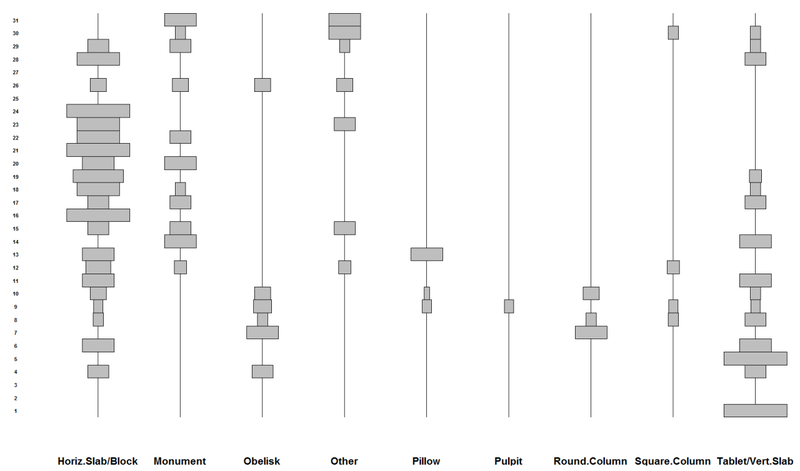 In the early period (1880-1930), men’s gravestone has more diversity of shape than women’s, such as tablet, round column, pulpit, and obelisk. 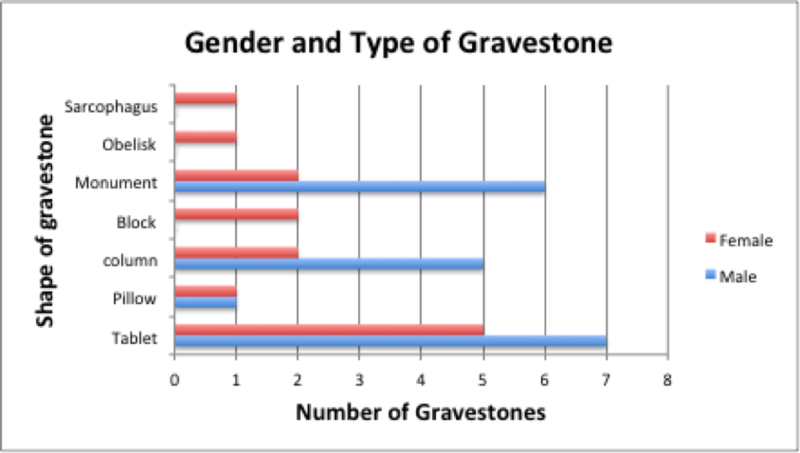 In the middle and late period, the common shapes of gravestone for both female and male are block and monument (see Graph1 and 2). About the materials, marble gravestones are more common in female group in the early period than male. When we examine the seriation of gravestone shapes (see Graph3), we find that obelisk is an earlier common shape, and then it was replaced by monument and vertical slab. The block is the most common style from 1880 to most recent. On the other hand, from 1880 to 1920, there are many different kinds of gravestone shape. However, after 1920, the diversity of shapes is less than previous period. From 1930 to 2000, the common shapes are block, monument and vertical slab. After 1990, the recent popular shape of gravestone looks like s chair. 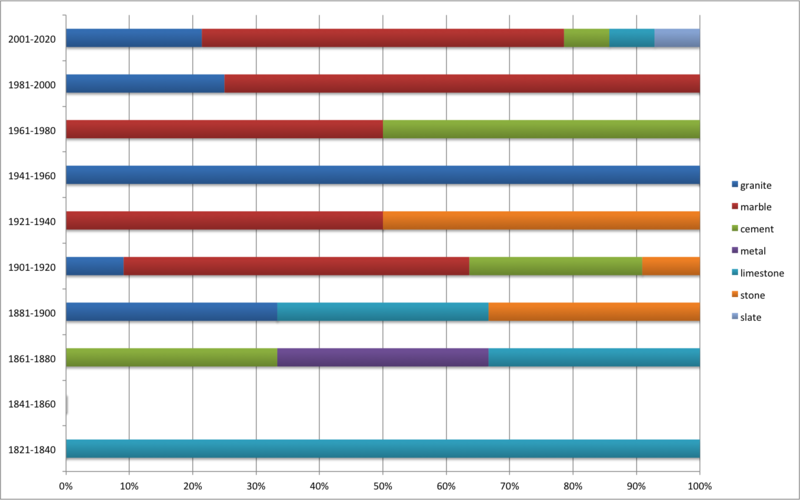 Based on this seriation, we know that the diversity of gravestone from 1880 to 1920 represents the men’s gravestone. And in the early period, the common obelisk style is only observed in male group in this case, which might indicate the different treatment to gender. After 1930, there is no big difference between female and male. This could be also observed from the kinship terms on the gravestone. In the early period, “father” is commonly appear in the male gravestone, but the kinship terms in female gravestone is “wife of…” instead of ”mother”. In the latter period, there is no obvious difference about kinship terms. This transformation might reflect the gender equality after 1930.